Beautiful personalised cushion, perfect for the happy couple to get cosy with! Looking for a unique gift for a newlywed couple? This Mr & Mrs Newlywed Cushion is the most wonderful gift for any couple that love to stay in and get cosy! 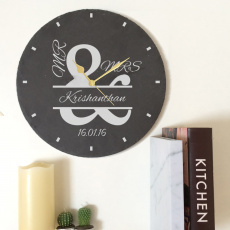 A gift that will stand out as a statement piece on the sofa, personalise this great gift with the family name and special date to make it a one of a kind gift. The perfect gift for a wedding, anniversary or even Valentine’s! This personalised gift comes in the colours Grey, White or Pink and is available as just the cushion cover or with the cushion insert as well. Please note that the surname and date will always be printed in UPPERCASE like the design. The cushion is made from 100% cotton and is sized at 50cm x 50cm. You can get your last-minute gifts as soon as tomorrow! Just select next day delivery when you check out!